10 games into the world cup and we’ve seen 33 goals and not a single 0-0 draw. The record number of goals in a world cup finals is 171 (France 98, the first 32 team tournament). If the current average of 3.3 goals per game is maintained then this world cup will yield an astonishing 211 goals! As well as there being no 0-0 draws there hasn’t been a draw of any kind so far. As Gary Lineker pointed out shortly after tonight’s France vs Honduras match, the last time a world cup was so ten games old without a single draw was 1950, coincidentally the last time Brazil hosted the world cup. Belgium have released three new kits for the 2014 World Cup in Brazil. Belgium are the only country at this summer’s tournament to be supplied by the Swiss/Qatari company Burrda Sports. The Red Devils have a red home shirt, a black away shirt and a yellow third shirt. The red home shirt features a black and a yellow horizontal stripe on the front along with a crown which is taken from the crest. 1. Ghana — WORLD CHAMPIONS! Essential for EVERY football fan this World Cup. i’ve complied some of my favourite Footie themed songs for you’re world cup party/BBQ. COME ON ENGLAND! I hate Pitbull so trying to take out any bias. I suppose its not a bad world cup song, Has lots of Brazilian flavour and could get a party started. Again, Not fond of Gary Barlow and his realllllly sloooow monotonous voice. I do like this song though. It’s quite inspiring and I like how it was for Sport Relief. With the tragic news of one of Britain’s finest comics of the 90’s Rik Mayall passing just the other day, this is straight at the top of the list. And there is even a campaign to get it to number 1 in his honour. I do like this. Rousing, inspiring speech, easy to sing along and ability to jump around with a pint too. Everyone’s favourite Geordie Duo recorded England officiall 2002 World Cup Song. They had a lot to live up too after “Let’s get ready to rumble” but proved they still have their MC skills. A good fun song, gauranteed to get everyone in party mood. Remix of 80’s classic. Highly contagious, an easy sing-a-long. Another remix, with Dizzee Rascals touch. Not a bad attempt. A catchy hit but the lyrics are a bit naff, especially for a MC of Dizzee’s calibre. Any song with “NA NA NA’S” in is great by my books. Catch, rowdy, jumpy classic. John Barnes Rapping. Enough said really. Everyone’s favourite. An Utter Classic. If you are English and you don’t know the words to this song you should have your passport revoked. The Official 1994 World Cup Song. COULD YOU IMAGINE SINGING THIS ON JULY THE 13TH!!!! Some other classics from around the world. I am half Irish, and see myself as more Irish than English, so this song was top of my list. Absolute belter! Not the official anthem of the 2010 World cup in South Africa, but I preferred this to Shakira’s effort, which sold because, well she’s Shakira, even I’d do her! This just had a better message and better African feel In my opinion. Official World Cup 98 Song, Catchy cheese – therefore I like and will get people shaking their bums. Not the greatest football anthem though. And this one deserves a special mention for being the worst football song I’ve ever heard. Sticker books are a superb educational tool. Geography, Maths, Art and Design, Hand eye co-ordination. Yup – It’s all there. I’ll soon be able to identify the Algerian keeper in a crowded room, be on first name terms with the Costa Rican back four, and I’ll be lethal in the ‘flags of the world’ round in any pub quiz. Old or young, collecting football stickers is an essential part of the excitement, ritual and tradition of the world cup experience. Still, there’s something comically pathetic about a grown adult entering a shop with the sole intention of purchasing five pounds worth of football stickers. The first few times I would tell the server at Tesco’s they were for my little cousin. I also desperately tried the self service, but the packets were too light and so the red light flashed for the staff member to come over and check. 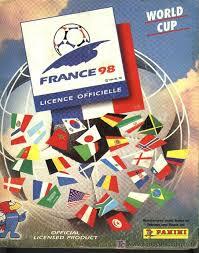 My first Panini sticker album was when I was 7 years old during the France 98 World Cup. Bright enough to work out the likely chances of ever having enough cash to complete the album, I instead decided to draw each footballer in his empty box using a limited array of crayons. Older people were much amused. All the kids in my year at school were totally obsessed with collecting football stickers. In fact, buying and trading these little cards became so popular that a thriving black market flourished at St Teresa’s Catholic School in Nottingham that summer. The playground transformed into a contraband marketplace, with players being bought and sold on at wildly inflated prices. I have collected stickers for every world cup up until the last one, 2010 in South Africa. I don’t know why I didn’t collect – I just didn’t. So when a brand new Brazil 2014 sticker album fell onto my lap one Sunday morning, free with my newspaper I was stopped in my tracks. It was like seeing an ex you’d forgotten you still had feelings for suddenly saunter into the bar. You start with 6 free stickers that can be found in every album. Yaya Touré? Got. Cristiano Ronaldo? Got. Hugo Lloris? Got. Gonzalo Higuaín? Got. Roman Shirokov? Got. Daniele De Rossi? Got. That leaves only 633 spaces to fill – a little bit less than 124 packets bought blind at an accumulative total of around £64. That’s the minimum spend, in the preposterously unlikely event that you’re lucky enough to get stickers you actually need each time, rather than end up withmultiple Han Kook-youngs, Phil Jagielkas and Wakaso Mubaraks. As well as players, the official World Cup sticker album features the usual highly sought-after “shinys”, special glitter stickers featuring the Panini logo, Fifa Fair Play logo, official World Cup ball, World Cup trophy, World Cup mascot and badges for each of the 32 competing teams. That’s a lot of shininess. Perhaps best of all, it also features two-part half-and-half stickers of the various World Cup stadiums, a state of affairs that enables collectors to add to the tournament’s authenticity by leaving many of the grounds half-finished in the run-up to kick-off. 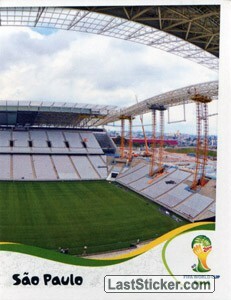 My first packet of stickers contained 50% of the Arena da Baixada in Curitiba. Five more packets down the road and the other half remains elusive, presumably on the grounds that nobody knows what it looks like because it hasn’t been built yet. But how much does it actually cost to complete the whole book? Working in the basis the people do not swap cards with others, research by two mathematicians from Switzerland has revealed that it costs just under £450 to get all the stickers needed. As for the maths, the mathematicians looked at the number of stickers needed to complete the Panini 2014 sticker album: 640. At 50p a pack, if there were no doubles or duplicates, the outlay needed to complete the album would be £63.99. But based on mathematical probabilities, the experts claimed that in fact 899 packs would need to be purchased, costing £449.50. So far I’ve been lucky. I’ve spent about £40 and only have 30 odd stickers to go (most of the flaming Iranian team). There’s a fair few of us going man in my friendship group and we’ve amassed enough ‘swapsies’ each, that buying packs has now been made redundant. But Still, at 530pm today, I will find myself in the newsagents after work, with a pound for 2 packets. I can’t help it. Nothing beats the feeling and sound of tearing open a new packet of football stickers.